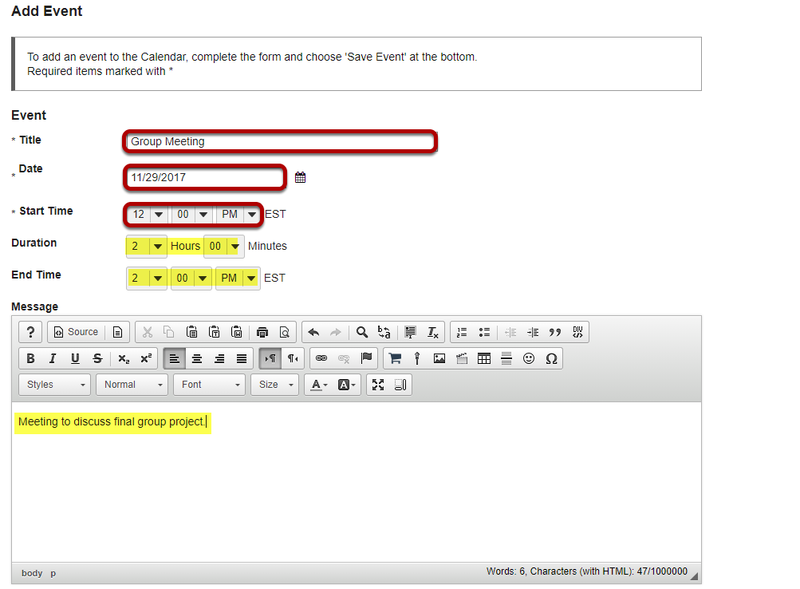 Sakai Guides and DocumentationSakai Complete User Guide CalendarHow do I add items to the Calendar? 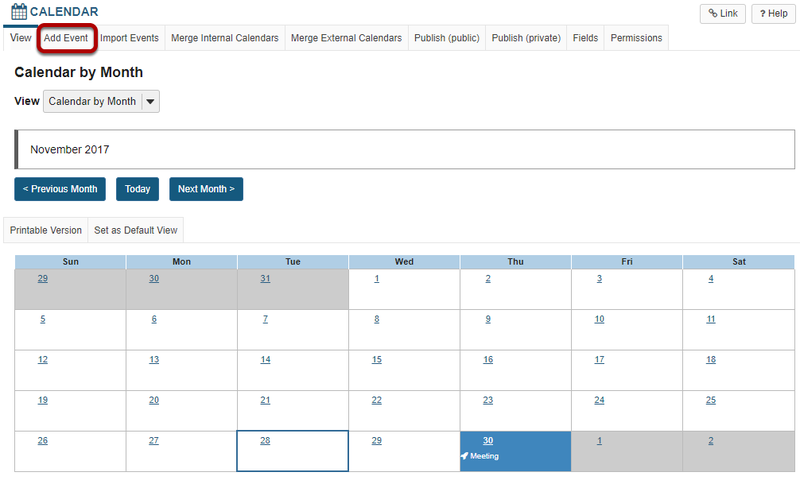 The Calendar tool allows instructors to post items to the class calendar. You may use the Calendar to post reminders about class activities and due dates. This lesson will show you how to add items to your class calendar. You will be taken to the default view of the calendar, the current date is highlighted. Click on the Add Event to create a new event. Note: multiple day (overnight) events cannot be added as a single event, they need to be added as an all day event with a frequency of daily. You must enter a Title, Date, and Start Time to create an event. All other fields are optional. Your Title will be displayed on the calendar, so it is best to make it something short and informative. For this example, we have entered Exam 1. The Date is the day that the event takes place. You may select the date from the drop-down menus, or you may use the calendar icon to the right to bring up a pop-up calendar for selecting your date. The Start Time is the time of day when the event begins. For a live event, the start time is easy to determine. If your event is simply a reminder about required reading or other non-time-specific activities on a certain day, you may enter any time you choose. If desired, you may also enter an event Duration, End Time, and Message. The Duration is how long the event will last. Selecting an amount of time from the Duration drop-down menus will automatically update your End Time accordingly. The End Time is when you expect the event to end. Selecting a time of day from the End Time drop-down menus will automatically update your Duration accordingly. You may also provide additional event details in the Message area. The rich text editor is available to you in the Message area, which means that you can format your text, or include images, links, or other embedded content as part of the event detail. You may select to display the event to the whole site, or to selected groups. Display to site is the default. Note: You must have existing groups (or sections) in your course for the groups option to appear. If you have groups in your class and you would like to post events that are only visible to specific groups, select the Display to selected groups option. The menu will expand to show a listing of existing groups and you may select one or several groups from this list. If your event happens more than once throughout the term, you have the option to modify the frequency of the event so that it posts to the calendar at specified intervals. 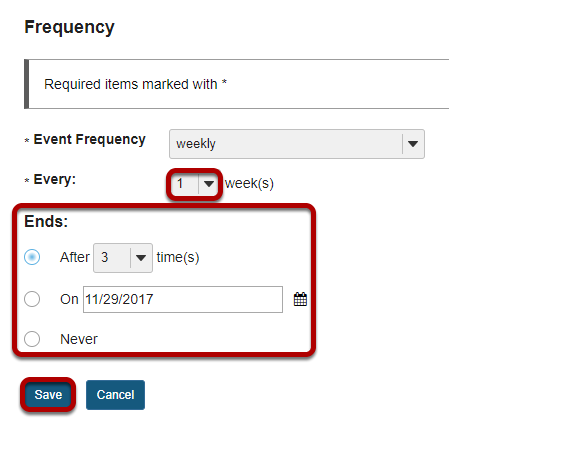 Click the Frequency button to add a recurring event. Select the frequency option from the drop-down menu that best describes your event. Specify interval and end date. Does your event happen every week, every other week, or some other interval? Select the appropriate interval from the Every drop-down menu. You also have the option to specify when the frequency Ends. You may select for it to end after a certain number of times, until a specific date, or never. For example, if you are posting office hours and you want them to repeat on the same day and time each week until the end of the term, then you might select the last day of the term as the end date. You may enter this date using the drop-down menus, or by clicking on the calendar icon to select a date from the pop-up calendar. Don't forget to click Save to save your changes! Click on the Event Type drop-down menu to view all available types. The default event type is Activity. Selecting a different event type. Zoom: Selecting a different event type. 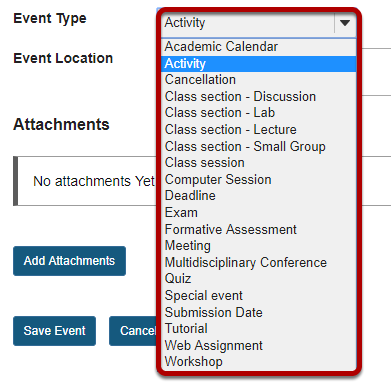 You may select a different event type if it is more appropriate for your calendar item. For example, for the Exam 1 event, you might select Exam as the event type. The type of event that you choose controls the icon associated with that event when displayed on the calendar, as shown in the legend above. It will also control the priority of the item as specified in the user's individual preferences. If your event is happening in a specific location, you may enter the Event Location here. Tip: For events with no physical location, you could enter Online, or Via Meetings Tool if you do not want to leave it blank. You may attach a file to your event if desired. For example, you might attach an agenda, a map or instructions on how to get to the location, or any other items that would be helpful for participants attending the event. 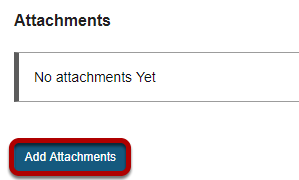 Click on the Add Attachments button to browse for and select your file. Once you have entered all of the information for your event, click the Save Event button to post your event on the calendar. Prev: How do I change the Calendar view? 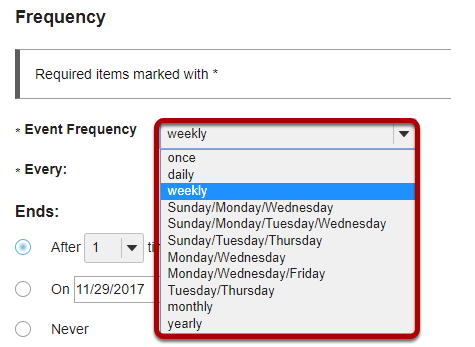 Next: How do I edit a calendar item?